Today is a long run of Per pale divisions with some nice use of tincture and three devices of nine with various blanket permissions to conflict (PtC) on file, which I always like to see with Field Primary devices because it makes it just a bit easier for other SCAdians to enjoy cool Field Primary devices of their own! Lucky Part Thirteen! Click for larger, see text for details. It’s genuinely hard to pick a favourite in this batch, they’re all nice solid designs! Being a fan of the heraldic furs I’ll favour Brigit the Chaste’s “Per pale indented gules and counter-ermine”, leftmost of the middle row a little bit, though. 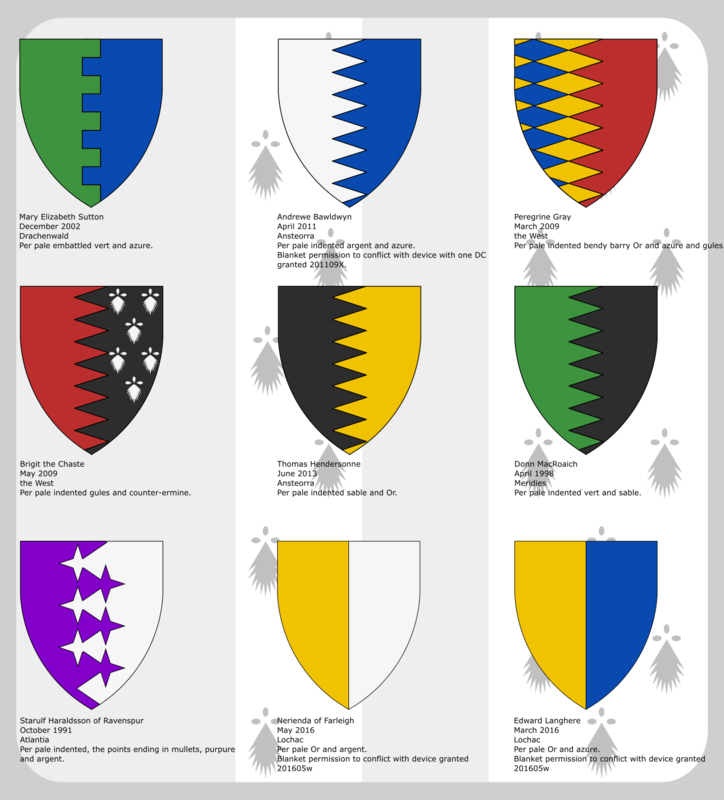 I’m also amazed that the two devices on the bottom row centre and right, Nerienda of Farleigh’s “Per pale Or and argent” and Edward Langhere’s “Per pale Or and azure” took until 2016 to be snapped up, and I’m very pleased they both filed PtC to make it easier for others. It goes to show that lots of simple, classic armoury is still out there if you’re willing to look in the O&A’s gaps!